The Cuban exodus is now over 41 years old and has brought close to a million Cuban immigrants to American soil — about 12 percent of the Cuban population. That exodus harbors distinct waves of immigrants, alike only in their final rejection of Cuba. The focus of this paper is on the exodus of Cubans in the nineties during what Castro himself called “el período especial” — the special period that resulted when the collapse of communism in the Soviet Union and Eastern Europe meant the end of the Soviet subsidy that Cuba had received for nearly 30 years. This research is part of a larger research project on the Cuban exodus and the Cuban revolution that began on the heels of the revolutionary transformation of Cuban society in 1959 and that, while intermittent, has never ceased and is ongoing still in the present. The goal of my research is to capture the processes of political disaffection of participants in this major historical drama, emphasizing the contrasts along the four major waves of the exodus not only in their social characteristics but also in their attitudes as members of different political generations. To establish the characteristics of this last wave, however, I often need to contrast it to earlier waves. Hence, I will first briefly depict the differences between the 4 major waves of the exodus. Each of the 4 major waves of the Cuban exodus has been characterized by a very different social composition with respect to their social class, race, education, gender and family composition, and values — differences that resulted from the changing phases of the Cuban revolution. They render the Cuban community in the U.S. today an extremely heterogeneous one, not only in terms of the dramatic contrasts in their social characteristics but also in terms of their processes of political disaffection as what E. F. Kunz (1973) called “vintages” — “refugee groups that are distinct in character, background, and avowed political faith” (p. 137). Nelson Amaro and Alejandro Portes (1972) portrayed the different phases of the Cuban political immigration as changing over time with the exiles’ principal motivation for their decision to leave. With the unfolding of the Cuban revolution, they argued, over the years “those who wait” gave way to “those who escape,” and they to “those who search.” To update their analysis, I added “those who hope” and “those who despair” (Pedraza 1996). The immigrants of the first wave (1959-1962) were Cuba’s elite: executives and owners of firms, big merchants, sugar mill owners, cattlemen, representatives of foreign companies, and professionals. They left Cuba when the revolution overturned the old social order through measures such as the nationalization of American industry and agrarian reform laws, and the United States severed all ties. “Those who wait” characterized these first refugees that came imagining that exile would be temporary, waiting for American help to overthrow Cuba’s new government. After the fiasco of the exiles’ Bay of Pigs invasion (April 1961), the exodus doubled and “those who escape” constituted the second phase. Castro called them counterrevolutionaries — gusanos (worms). The second wave of migration (1965-1974) arrived through the air bridge which resulted when the United States and Cuba negotiated the orderly departure of Cubans. “Those who search” characterized this wave of migration that Alejandro Portes, Juan Clark, and Robert Bach (1977) studied, a wave that was largely composed of la petite bourgeoisie: cooks, gardeners, domestics, street vendors, barbers, hairdressers, taxi drivers, and small merchants who left Cuba when Castro launched a new “revolutionary offensive” in Cuba, confiscating over 55,000 small businesses (Mesa-Lago 1978). With the economic transition to socialism effected, in the 1970s the Cuban government cast the shape of the political system — an institutionalization during which Cuba took on the features of Eastern European communism. The old idealism and romanticism of the 1960s gave way to what Carmelo Mesa-Lago (1978) called pragmatism. In 1978, a Dialogue took place between the Cuban government and the Cuban community in exile as a result of which the Cuban government agreed to the release of political prisoners and to promote the reunification of families by allowing Cubans in the U. S. to visit their families in Cuba. Those visits were partly responsible for the third wave — the chaotic flotilla exodus from the harbor of Mariel in 1980. Towards the end of the outflow, this wave included Cuba’s social undesirables, many of whom had been in prison (whether they were political prisoners, were common prisoners who had committed real crimes, or had only challenged the state). Castro called them escoria (scum). The most salient characteristic of the Marielitos was their youth (most were young men single or without their families) and the visibly higher proportion of Blacks than ever. As Robert Bach’s (1981/82) studies of the Marielitos highlighted, this last exodus was overwhelmingly working class, mostly composed of blue-collar workers. Along with them came a significant number of young intellectuals (the most famous of which was Reinaldo Arenas), who recognized themselves as belonging to a political generation that they themselves called la generación del Mariel (the Mariel generation), and went on to found several journals. “Those who hope” might well characterize this wave. Recently, the fourth wave of the Cuban exodus to the United States developed (it began around 1985 and deepened in the nineties). Cuba’s economic crisis reached new depths when communism collapsed in the Soviet Union. Cuba’s enormous dependence on the Soviet Union (cf. Mesa-Lago 1994) meant that when the latter disappeared, it brought about an economic crisis of such severity that Castro himself declared this a “período especial” — a special period that was to have been temporary, but coupled with the United States’ tightening of the embargo in 1992, have made abject need and hunger a daily reality for Cubans. Indeed, Cubans became so desperate that they began leaving on balsas (rafts, tires, makeshift vessels) that drifted on the ocean, risking death due to starvation, dehydration, drowning, or sharks. Over 34,000 left just in the summer of 1994. “Those who despair” constituted this last wave of migration. While the émigrés of the first two waves were those that became politically disaffected in the process of the transition from a democratic, capitalist society to a communist society, the Marielitos as well as the recent émigrés are those that, especially the young, became politically disaffected from the only society they ever knew — Cuba in communism. As such, they are the children of communism. At stake very often are different political generations. As defined by Karl Mannheim (1952), a political generation is constituted by individuals of approximately the same age who shared, in their coming of age (roughly the young adult years of 18-25), certain historical experiences that shaped their political outlook. For example, in the early sixties the dramatic social changes taking place in Cuba were those associated with the transition from capitalism to communism, while in the early eighties the enormous changes taking place in Cuba reflected the debates then raging within the communist world — glassnost and perestroika. Young people who lived through such distinctly different stages of the history of Cuba and the revolution constitute different political generations. While the exodus of Cubans have been studied from the point of view of the social and demographic characteristics of the various waves, it has hardly been studied from the point of view of the political attitudes of the émigrés. This is ironic for a community that defined itself as being in exile, and where — both in the island and outside of Cuba — participants in this major drama thought of themselves as belonging to different political communities. Living the revolution inside the island, joining the exodus that left the island, living el exilio (the exile) in Miami, being imprisoned for their political activities in Cuba, and being active in the dissident movement within Cuba entailed becoming a part of or exiting political communities that defined themselves against one another. Those who chose to stay in Cuba integrated to the revolution ascended in social status but suffered the emotional loss of their family who left, though at times they also rejected and repudiated them. Those who chose the path of exile and left Cuba suffered not only the material loss of property and status but also the emotional loss of their memories and the community of peers with whom they had once shared their childhood, adolescence, or old age. Those who joined the dissident movement (that eventually emerged in Cuba as an organized political force in the mid 1980s) found themselves repudiated and shunned by even the most intimate of family and friends. As declared dissidents, they experienced an isolation that was both social — becoming pariahs within their own country — and often also physical and mental — when they suffered imprisonment. Those who chose the path of exile had been profoundly alienated while in Cuba; once in Miami, some again found themselves alienated, now from the oppressive conservatism of el exilio — victims of a double alienation, possibly, a double exile. In short, the revolution and the exodus were deeply intertwined not only as historical and political processes but also as cognitive and emotional processes. Mistrust, fear, betrayal, isolation, humiliation, denunciation were part and parcel of the lives of Cubans as they lived through a historical and political process that forced them, over and over again, to define and redefine themselves, to side with one political community against another. To date, this attitudinal, emotional, and experiential dimension of the Cuban revolution and exodus had not been explored. Using the distinction developed by Albert O. Hirschman (1970) in Exit, Voice, or Loyalty, over a period of about 2 and a half years, I conducted 100 in-depth, semi-structured interviews with people who were representative of the four major waves of the Cuban exodus and who were also protagonists of what are now four major political communities. As I see it, the four major political communities that developed overtime are: the supporters who never wavered and became highly integrated to the revolution (loyalty); those who remained in Cuba but uninvolved in the political process (neglect); the exiles who rejected it and joined the Miami political community (exit); and the dissidents who, living their criticism within, both support the revolution and reject it (voice). While cross-sectionally all of these communities exist at present, overtime people also left one to join another. My interviews were guided by the concepts of “vintages,” political disaffection, and political generations, concepts that help to capture the changes in political attitudes across time, for the same person, and across social groups at the same historical moment. A central hypothesis of this research is that the critical experiences that promoted their processes of political disaffection — by which I mean the loss of faith and trust in government and cause — will vary quite markedly across the major waves of migration, not only because of their varying social composition (social class, race, age, gender) but also because they represent different political “vintages” — refugee groups that are distinct in character, background, and avowed political faith because they lived through and experienced very different stages of the revolution. The interviews were conducted not only in Miami — where the bulk of them were conducted, since Cubans see Miami as “the capital of the Cuban exile” — but also in New York (the Bronx, Manhattan, and Brooklyn, which are very different social worlds), in New Jersey (Union City, Patterson, and Elizabeth, the communities that used to comprise the second largest Cuban community in the U.S.), and in places where sizable communities of Cubans in exile exist, such as Chicago, Los Angeles, Texas, Puerto Rico, and Spain, as well as among Cubans who live surrounded by only a few Cubans. This geographic spread represents the major Cuban communities of settlement. I also want to stress that the 100 interviews that I conducted in total are the 100 persons that I sat down to tape their interview on their life experiences. In a more informal manner, I interviewed easily three times that number of persons, as the result of the substantial participant observation that I engaged in the various Cuban communities over a four year span, as I grew to know the Cuban community from a multitude of vantage points. That field work, participant observation, was the foundation for this research effort. As a result, the community itself more often than not identified who I should interview to represent the particular political community they knew well — “You should talk to such and such.” I also entered the community in many different ways — through the rich, through the poor, through hospitals, schools, organizations, apartment buildings, and the like. Contrary to what is known as snowball sampling, I never took more than one suggestion for another interview from each respondent, so as not to tap into that person’s social network too much. Nonetheless, Cuba is a small island, and at the time of the revolution, most people who were well educated in the private schools that existed then, knew one another; most dissidents who joined the formal organizations of the dissident movement that sprang in the late 80s knew one another, and the like. Hence, one often taps into networks, yet my effort to enter the community through many different ways was an effort to minimize this. Moreover, it is important to stress that because the Cuban revolution and exodus to this day remain a very live issue — not one in the past, but still in the present — and a highly politicized one on both sides, where people are often afraid to speak the truth in public, these were interviews that could not have been conducted in the absence of a trust relationship. Hence, I either developed a trust relationship with the subject of my interviews myself — as I did by first reaching out to them via letter, including some of my previous writings on this topic, and letting them know why I wanted to interview them — or someone else lent me theirs: “You talk to Silvia as if you were talking to me,” a trusted friend often said to my potential interviewee. Without the trust we developed, much of what people told me would not have been told. 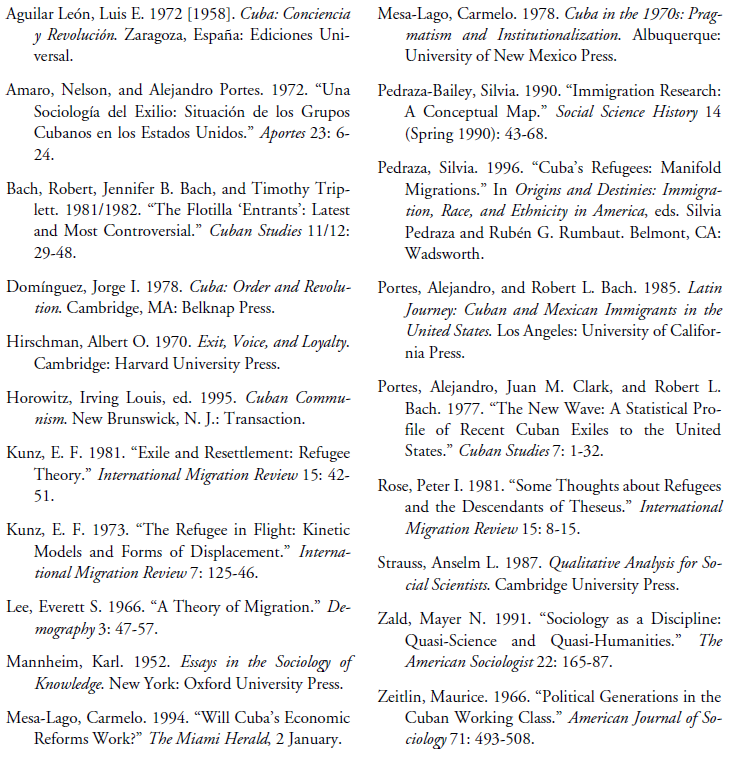 Of the 100 interviews I thus collected, 32 were with Cubans who emigrated during the special period, interviews on which I base this paper. Because the number is small, my emphasis is not on the numbers but on the range of political expression these latest émigrés represent. Since this wave of the exodus is still ongoing, we cannot yet characterize its definitive social and demographic characteristics (e.g., the balseros (rafters) have recently given way to the lancheros (boatmen) and the latter clearly have a great deal more money than the former). But it is possible that this latest wave may yet be the most heterogeneous to date. The typical interview, taped, took from 4 to 6 hours, although some took two days (some people had lived 9 lives!). To preserve anonymity and confidentiality, all names and other identifying information were changed when requested, although many people chose to be interviewed under their own name. The respondents were of all races; men and women; young and old. Many were professionals — a doctor, a journalist, a lawyer, University professors, a biotechnician, a priest, a physicist, a government technocrat, some of whom had participated in international missions overseas; and University students, including some that Castro himself called gusanos rojos (red worms) because they left while studying in the Soviet Union, and a student that represented what are now called los quedaditos (those who stayed) who left while on a trip taken abroad to study or work. My interviews also included many artists and intellectuals — a painter, one who worked in film and theater, a gifted musician. They also included working class Cubans who lived in the city — one who worked in the tourist industry, another in the tobacco industry, and in construction, as well as a guajiro from the countryside who worked in a sugar mill. The interviews encompassed Cubans who left in a myriad of ways — who crossed the Rio Grande as mojados (wetbacks), as Mexicans have always done, as balseros (rafters), “balseros aéreos” (who came by plane because they had more money, but otherwise were very similar to the balseros), those who lived in the tent city of Guantanamo Bay for about a year and a half; and those who left Cuba to study abroad (in Italy, France, and Russia) and never returned to Cuba, or returned to then leave again. They included Cubans who formerly were active members of the dissident movement, as well as those who did their best to stay out of politics altogether, and those rebels who landed in prison for their political activism or simply because they challenged the state. My interviews also included Cubans of all races and ethnicities — White Cubans, Black Cubans, Mulatos, Chinese Cubans, Cuban Jews, Cubans of Lebanese ancestry. And they included Cubans of all religious persuasions — Catholic, Protestant, and Jewish Cubans, a Santero (a priest in the Santería religion, the syncretic blend of Catholicism and West African religious beliefs now widely spread in Cuba), and some who grew up in Cuba without any religious instruction, as atheists who, as one of them put it to me, wish they knew how to pray, but did not. Thus, rather than seek statistical representation, which in a small sample would fail to include Cubans in small numbers, such as Cuban Jews, Chinese Cubans, and the like, I sought to represent Cubans as social types. In a small sample, admittedly, this means that they all have the same weight, but they better represent the full gamut of what it means to be Cuban. In addition, I often interviewed members of the same family, so as to better explore the issue of family dynamics, which interested me. However, if they made the decision to leave Cuba as a family decision, I counted them as just 1 interview; while if they made the decision to leave as separate individuals, and thereafter met and married, I counted them as 2 interviews. Hence, my 100 interviews include many more than 100 persons. The interviews themselves took place in either the person’s home or their office, so that I could also grow to understand them in the social context where they lived or worked. This also allowed me to occasionally point to photographs, paintings, and the like, as a way of discussing the issues the interviews deal with. Because the interviews had a great deal of depth to them, often times they provided both of us with a friendship, so that I remained in touch with many of the people I interviewed. That also allowed me to see their reaction at later times to other events, to hear things that were said outside the context of the interview but that pertained to the issues at hand. Even more, when I traveled I often met the remainder of the family or close friends that had been left behind in Cuba, or who now lived in Houston or Spain. Hence, the interviews themselves ran very deep and a great deal of the social context of people’s lives also surrounded them. Because the Cuban revolution is now very old — 41 years old — the generational differences in experiences and attitudes between those who made the revolution and felt affirmed by it — were its protagonists — and their children — who only inherited its problems — are profound, resulting in very different motivations for the exodus. César Mata, a surgeon who was greatly respected in Cuba, left at the age of 47, primarily due to family reunification reasons. He wanted to be reunited with his daughter, who sailed away in a stolen boat with her boyfriend. This is not to say that Mata had no political differences with the society in which he lived; rather, that he had adjusted to those and carved a life in Cuba that gave him satisfaction. In the beginning, his identification with the revolution had been very profound. Two of his uncles had fought together with Frank País, in the uprising of the 30th of November, 1956, in support of the arrival of Fidel Castro aboard the yacht Granma to Cuba. When the revolution triumphed in 1959, he had been rather young, only 12 years old, but he had felt it in a very personal way, because family members had died fighting against Batista. However, he pointed out, while his family was composed of many committed revolutionaries, they were not communists because communism had nothing to do with the revolution when it was initially fought. His identification, therefore, like that of his family and most who actually fought and risked their lives in the revolution, was with being a revolucionario (revolutionary), not with being a communist. Therefore, as the revolution progressively took the course of communism, his doubts increased and he increasingly felt that he had to convince himself that the truth lay with Fidel and communism, as he tried to justify policies, such as the October Missile Crisis, that he felt were wrong. And yet he lived within the system, as he put it: as a miliciano, who guarded against possible invasions; as an alfabetizador, who went to the rural areas to teach the peasants to read and write; as a participant in public acts that revolved around the government and sang the International; as a becado, on a fellowship who attended military schools and who went to the countryside 9 times to cut sugar cane while studying medicine. He ceased being a revolutionary progressively. In the beginning, he said, he had been a 100 percent revolucionario; but after the “civil war,” as he called it, that culminated in Playa Girón (Bay of Pigs), and especially after the October Missile Crisis, which he felt glad the Americans had won, he felt that he was only 50 percent revolucionario. The Cuban revolution was consolidated and the effervescence of the early years — what could be called the revolutionary moment properly speaking — was over with. Then began a new stage that, with the aid of the Soviet Union, was very stable for many years. Cuba was part of the communist bloc, that comprised nearly half of mankind, social inequality was not very great, and those who remained behind — after most of their circle of friends left — had to adjust to life as it was and lead a normal life. He himself put all his energy and talents into becoming a good doctor and became a surgeon, and he took pride in helping to create the first coronary unit within a hospital in Cuba, only the second in Latin America. Doctors came from everywhere in the world, he said, to see what Cuba had done in public health. Today, he said, to concentrate on creating something of value in Cuba through your work is no longer possible; in the special period the aim has become to survive — any way possible. Likewise, Tomás Medina had also lived well and adjusted to life in Cuba. He was educated in the United States as a young man in the 1950s, and came from a family that had quickly gone from being poor to being very rich in Cuba — from going places by bus to being driven by a chauffeur, he remembered — and whose father had, at the beginning of the revolution, held a high post in a ministry. However, his father was viscerally anti-communist and had helped many people in Cuba leave in the early years, securing passports for them, until he himself was imprisoned. As a result, Tomás himself was never fully a believer in the revolution. He had, however, risen “as high as is possible,” he said, “when you are not a Party militant, come from a bourgeois family, and have close family in the United States” due to his hard work as a wellqualified economist that was involved in economic planning in Cuba. He had also never wanted to leave Cuba, especially since he knew first-hand the problem of race in the U. S. and he himself was Mulato. As a member of the tecnocracia, in Cuba he had lived well in a penthouse overlooking the Malecón, had traveled throughout the world representing Cuba, and had no real economic problems. But his family problems loomed large. For his sons threatened to leave the country on a balsa, risking death. Tomás, therefore, made the choice to desert in 1996, at the age of 59, while working overseas on a foreign mission, thinking he would later be able to bring his children and wife. Younger Cubans, however, who perhaps had not yet had the time to work out a modus vivendi, often had more purely political motives in their experience. For example, Oscar Aguirre and Natalia Goderich (the names here are real), a young married couple with 3 beautiful children, were both students in the Soviet Union who eventually became what Castro called gusanos rojos (red worms) when they failed to return to Cuba. Natalia is the daughter of a Russian mother, who taught Russian history to students who were going to study in Russia, and a Cuban father, while Oscar is all Cuban. Both were born in 1966, and grew up, therefore, fully within the revolution, without ever having known the old society nor what César Mata called “the effervescence” of the revolutionary moment. In the years when they were reaching adulthood, both were studying in Russia — as were approximately 10,000 other Cuban students. But they arrived there at a time when young Russians their age were living, very fully, the processes of change that we came to know as perestroika and glassnost. Oscar himself had grown up around family who thought that Cuba was nothing other than a disaster: “We were always gusanos,” he said. Natalia, by contrast, grew up surrounded by family who were true believers in communism, as she herself had been, until they grew disillusioned. Her father, who had been an economist working with the central planning board, the arbitrary use of power in the case of General Ochoa had been “the drop that made the cup overflow.” In Natalia’s case, her love for Oscar had been decisive, coupled with her experience in Russia when they went there to study and live for 8 years. Suddenly, due to glassnost, there was no longer censure and all the literature in the world was available for them to read and to consider on their own. Moreover, Russian students were deeply engaged in this process and the dorms where they lived were hotbeds of discussion that would last late into the night. After the first two years studying in the Soviet Union, Oscar and Natalia married and were able to move to married student housing, away also from the ideological control most Cuban students were under then, and close to students from many other countries. Worried that the Cuban students would catch the flame of perestroika, Cuba sent some representatives to explain to the students that Cuba’s process was different, not a perestroika, but a process of rectification of errors. But the Cuban students had already begun to discuss quite freely, and had openly debated the extent to which in Cuba there was a personality cult. Ultimately, Oscar’s open criticisms regarding the extent to which Cubans are not allowed to speak freely, to travel, to be masters of themselves, cost him the end of his career, for he was only one semester short of graduating with excellent grades when he was “expelled at the request of the Cuban embassy,” as his transcript reads. Natalia was saved from a similar fate because she could remain there on her Russian passport and because she also had the backing of her Dean, “a man of new ideas,” as she put it. Oscar went to Germany and actually witnessed the fall of the Berlin Wall, after which he returned to Russia and told Natalia that they would not be returning to Cuba. She finished studying while he cared for their first child and worked at whatever he could, as a barman for a couple of years, and they went on to found the Unión Cubana, to help the over 100 other young Cubans in their situation who had become illegal and could neither return to Cuba nor gain political asylum in Russia. Eventually, they were able to come to the United States in 1993, thanks to Jorge Mas Canosa’s “Program Exodus.” They were then 27 years old, young enough to remake their lives and have 2 more beautiful children and have her parents join them. Yet with the weight of a large family to be responsible for, Oscar never finished studying metallurgical engineering. He makes a good living as a self-employed electrician, while Natalia first taught Russian and Spanish and now teaches high school Physics. The experience of studying in Russia during the years of glassnost and perestroika changed the way of looking at the world — what Max Weber called the weltanschaung — for many Cuban students. Not all, however, became gusanos rojos. Some returned to Cuba, like Heriberto Leyva (name is real) who had gone to Russia to study Philosophy. In Cuba, he had been a member of the UJC (Unión de Jóvenes Comunistas) and had always attained the very best grades, as he did again in the Soviet Union. But while there he underwent a deep attitudinal change as he “began to breathe the air of freedom” and began a process of change in his consciousness as he started “to open myself up to the changes that were taking place there.” It was he that, in the students’ debates, had underscored that in Cuba what people were living was a personality cult. They were freed on the condition that they leave the country or the capital. So they left for Oriente, and resumed their political activism there. Two months later, Radamés and Néstor were again arrested, while Heriberto escaped. Eventually, Radamés left the prison and lived under domiciliary arrest in Palma Soriano, while Néstor was in Baracoa. Nonetheless, early in 1997 together they wrote the document called “La Carta Cívica Universitaria” and they again sent it to the official government organizations, denouncing their treatment and asking for a plebiscite or referendum in the Universities so that the faculty and students could decide for themselves whether they agreed with their project of academic freedom, and at the same time they wrote a letter to China, in solidarity with the Chinese dissident Wang Dan that also worked for a pro-democracy university movement. Soon they were once again in jail, where they remained until their names were included in a list of political prisoners whose freedom the Pope requested during his visit to Cuba in 1998. Georgina Mestre’s story shows the impact of the economic conditions as well as the profound generational differences in experiences and attitudes that now exist in Cuba between those who made the revolution and felt affirmed by it — were its protagonists — and their children — who only inherited its problems. Georgina is a tall, impeccably well-mannered and lovely woman who left Cuba when she was 30 years old for Venezuela under the guise of a marriage by proxy to a Venezuelan citizen, as did her real husband. She was born in the Soviet Union while both her parents finished their college education there. She described her father, a convinced communist to this day, as being very grateful to the revolution because, coming from a very humble family — his own father had made and sold brooms — the revolution had made it possible for him to study and to become “someone,” to have a career. Her mother’s social origins were also very humble, as her grandmother ran a boarding house to supplement her husband’s meager seasonal earnings cutting sugar cane. Georgina’s father was only 14 years old when the revolution triumphed, so he had been too young to fight for it, but he and his wife enthusiastically became integrated to the Jóvenes Rebeldes (Rebel Youth). Moreover, the government had given him a nice house, a car, enabled him to travel — things he thought he could not have otherwise obtained and enabled him to become middle class, a professional, and manager of several major industries involved in machinery. This experience, coupled with his studying in the Soviet Union together with his wife, had made Georgina’s parents fervent believers in the revolution, unwavering to this day. “My father and I respect one another,” she said, “respect each other’s beliefs.” Still, in his letters he would invariably find a way of pointing to the accomplishments of the revolution — and whatever was wrong with Cuba he would always blame on the U.S. embargo. Georgina herself, however, underwent a process of profound political disaffection that — as was usually told to me by most people I interviewed — was gradual and cumulative, “until one day you suddenly see it differently,” she said, but it comes about gradually. In the 1970s, when the economic inequality that began to characterize Cuba during the special period had not yet arisen, and Georgina herself was in her teens, there was also no freedom of expression, no civil liberties, but since in her circle of family and friends at that time she knew no one who thought differently, she did not miss them. Wherever she turned, the consignas on the billboards, the radio, television, read “¡Viva Fidel!” or “¡Patria o Muerte!” (Fatherland or Death!). And in the pre-University years, she took a leading organizing role in the FEEM (Federación Estudiantil de Enseñanza Media). The change in her attitudes began to come about in the mid to late 1980s when she began studying electrical engineering at the CUJAE (Instituto Politécnico Juan Antonio Echevarría), where she met people of all persuasions. Although she became a member of the UJC (Unión de Jóvenes Comunistas — the Young Communists), and she remained convinced, she began to exchange opinions and to discuss with people who were not in favor of the revolution. These students’ parents had tried to leave Cuba, and had suffered a great deal there — because they had been political prisoners or because they had been the objects of violent actos de repudio (repudiation acts) when they tried to leave during the Mariel exodus. “Then they began to explain all that to me,” she said, “and I began to know a world that I had not known existed.” She herself had participated in those actos de repudio when she was only 11 years old in her school and her teachers and principals had given her tomatoes and eggs to throw at those who were trying to leave through the port of Mariel. Like all the young girls then, she sang and danced the insults of gusanos and escoria, not understanding why those people wanted to leave, simply following what she was told: that they were counterrevolutionaries and bad people. She never heard anything good being said about capitalist societies, but only about the seamy side of the poverty and inequality that reigned there. To her, the fundamental tenet of socialism was equality. And her new friends at the University also pointed out that not everyone in Cuban society was equal — that the party elite and their children had many privileges others lacked. “When I met people whose opinions were different, I realized for the first time what freedom of expression meant.” And she also learned that some people had been jailed only because their opinions were different. Moreover, when she began studying law, she tried to hold an open discussion in the classroom regarding why Cubans who wanted to form another political party were not allowed to do so, and the professor and other students insisted that she should not express herself in that manner since Fidel had said that these people were nothing other than a “grupúsculo” (a tiny group, labeled with contempt) maintained by the Cuban American National Foundation whose intent was only to sabotage the revolution. And then she fell in love with a young man who was a dissident. At first they fought a lot, because their points of view were different, but they always came back together. And as a result of her love for him, a new world opened up for her in Cuba — that of the dissidents — that she had not known existed. “And then he began to change me,” she underscored. Though this boyfriend was not the man she would later love and marry, his impact on her feelings and attitudes was decisive. Indeed, most people I interviewed showed the impact of the political commitments of those they loved deeply and admired — whether a boyfriend, father, sister, or friend — on their own. Thereafter, the economic problems in the 1990s dealt yet another blow to the profound process of political disaffection she had already undergone. For her husband worked as a doctor in the tourist industry and, therefore, he had access to dollars. In addition, his family in the U. S., regularly sent remittances. Thus, very soon, she began to live a life very different from that of her sister and family, who had no access to the dollar economy that had grown side by side with the economic problems in Cuba, and began to belong to a new social class that has grown in Cuba in the last decade, in contrast with the poverty in which the vast majority of Cubans live, including most of Cuba’s professionals. This new social class that has emerged is rather ostentatious in its economic behavior and, though hardly supportive of the government, is mostly apolitical. Georgina and her husband had a car, could travel to the beautiful tourist spots of Varadero and Soroa, threw a birthday party for their one-year-old with a clown, piñata favors for the children, beer, pop, and cake for the adults. She and her husband also ate well and would invite the rest of her family to eat a nice dinner with them every Saturday — often the only time of the week her family ate meat. In my apartment building, she said, they began calling us los millonarios (the millionaires). That, however, eventually also became a reason to leave since they began to fear for her husband’s safety, as they were becoming señalados (noted). “It was the economic problems that opened up the eyes of the people,” she underscored. Today, Georgina works in an old folks’ home in Los Angeles, trying to learn English while she cares for an old man in a wheel chair, care that she gives with a lot of affection while also being a mother to a 4-yearold. She hopes that she can in the future study another career than law. While corresponding with her father — whom she still admires since, as she said, he never harmed anyone nor was opportunistic — they both try to avoid a political confrontation, though they each tell the other what is good about the system in Cuba and in the United States. Juan López’s story is also instructive regarding how the political and economic are deeply intertwined for many people in Cuba in the 1990s. In the summer of 1994, at the age of 29, he finally succeeded in his attempt — for the third time — to leave Cuba as a balsero. By training an engineer, he loved working in a sugar mill in the Cuban countryside in Camagüey. So much so, that when he first arrived to Tampa, he tried to find work in a sugar mill in northern Florida, where “everything was green for miles, covered by sugar cane, and where you could smell the burnt sugar smell” that filled his senses with delight. Unsuccessful in this venture, he began working as a security guard in a high rise condominium. In conclusion, my interviews tell me that among Cuba’s most recent émigrés, some Cubans left motivated by family reunification considerations above all because they had already made an adjustment to living in Cuba “as is” and carved out a satisfactory life for themselves until their children, who had not developed any such modus vivendi “pushed’ them to leave. Some Cubans also left for purely political reasons — they left irrespective of the economic conditions in the island, and would have done so in times of plenty, because to them the central issue was the Cuban government’s systematic violations of civil liberties and human rights. And some Cubans left because for them, the political and the economic were profoundly intertwined — the bulk of my interviews. For them, the profound economic problems Cubans lived through in the nineties led to their political disaffection. 1. This research project was supported by the American Sociological Association’s Fund for the Advancement of the Discipline (1995- 96) and by the University of Michigan’s Horace H. Rackham School of Graduate Studies’ Faculty Grant and Fellowship (1997-99).